So how’s my hand doing one year later? Well, it’s looking pretty good. 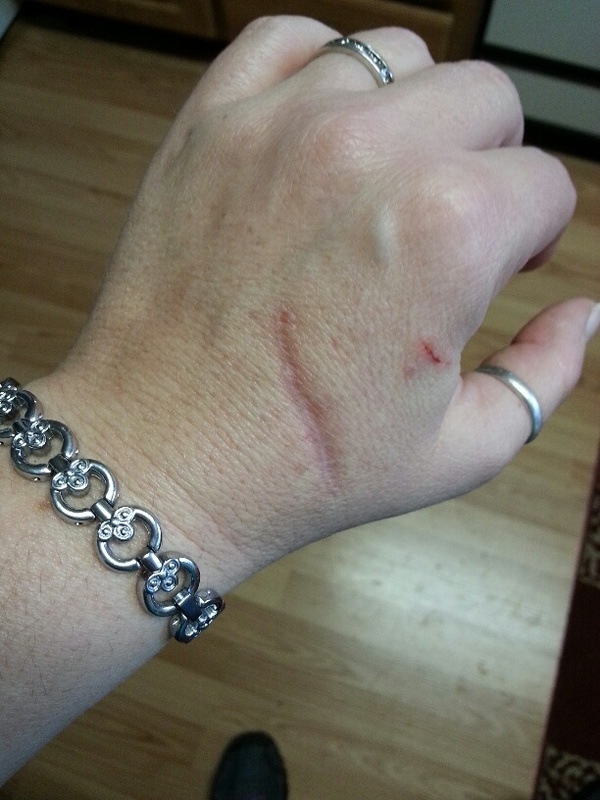 The scar is fading (and disregard that other small cut. I scraped my hand on a nail today. And yes, my tetanus shot is up to date. Got it one year ago exactly). I don’t have too much lasting nerve damage. Just a little bit of numbness in the skin near the cut. And the only time it ever hurts anymore is if I hit it on something. Like yesterday, I hit it on the edge of the table. Oh, my, GOSH, that hurt! But otherwise, I don’t even think about it every day any more. Or if I do it’s a passing thought that doesn’t really enter my conscious. Over all, I am so blessed it wasn’t more serious. And taking a picture of my hand reminded me that I’ve been wanting to do an EDC post for forever. What is “EDC” you might ask. It stands for Every Day Carry. My hubby watches YouTube videos of gun guys and outdoor enthusiasts and they are always talking about the things they carry on them every day. What does my hand have to do with my personal EDC? Well, in the picture you can see my watch. Yes, that pretty bracelet is a watch. So here is this Homesteader’s EDC and some of the philosophy behind what I carry on my person every day. Not everything is related to homesteading, and some of it applies to my particular situation, so not everything would apply to everyone. Watch: First, as in the picture above, I always wear a watch. I know lots of people who use their phones as a clock, but I believe it’s very practical to have one on you that you don’t have to pull out of your pocket to see. What if you’ve got mud and guck all over your hands as frequently happens to a homesteader? And it has to be waterproof! I’ve killed too many non-waterproof watches just by washing my hands or forgetting I have it on and getting in the shower. This last Christmas, one of my moms got me the one I now wear every day. It’s waterproof so it’s pretty and practical. I love it! 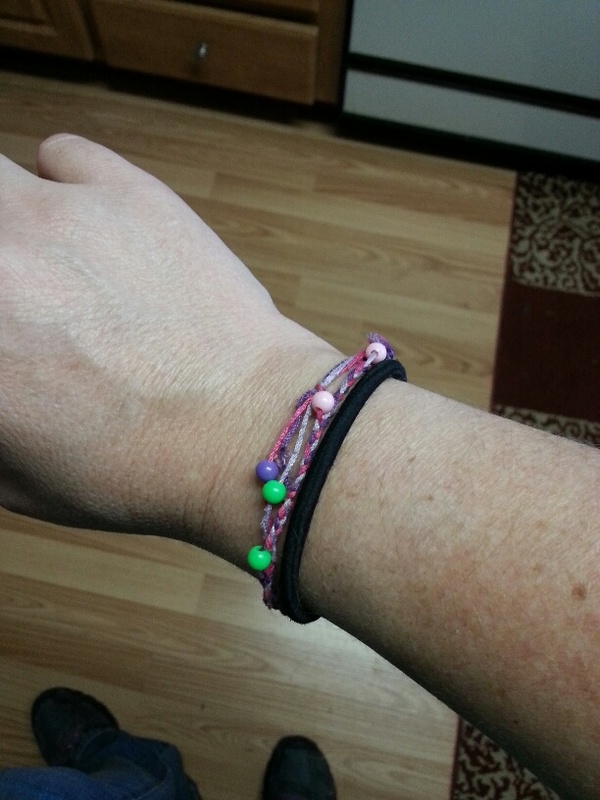 Hair Tie: Next, I’ve always got at least one hair tie on my other wrist (along with a bracelet that Princess Girl made for me). With three females with long-ish hair in our family , I am always in need of a band to get one person or another’s hair back out of the way. I found these extra large hair ties at the grocery store. They are actually a bit loose on my wrist, so they don’t cut off my circulation. And the three of us have thick hair anyway, so they work great. But even if one or more of us had thin hair, the convenience of always having one on hand (pun not intended 😉 ) would outweigh the inconvenience of having to twist it around a pony tail a few extra times. Chapstick: I’m very particular about my chapstick. I only like one particular brand and only a couple of the flavors they produce. That’s the biggest reason I’ve never tried making my own. But I always have chapstick with me. Even up here in the humid Pacific Northwest, I use it on my lips a couple times a day. And down in arid Nevada? Yeah. I think you can figure that one out. Another reason I’ve never tried making my own chapstick is that I need it to have a good SPF in it. The ones I buy are SPF 15, and when I’m out in the sun, I slather it on. If I don’t , I will end up with cold sores on my lips. No fun. Also, it works as a quick sunscreen for noses and cheeks if we find ourselves frying out in the sun without any on hand. I buy other chapsticks every once in a while to try to find another one that I can tolerate which has better ingredients. So far, I’ve struck out. Flashlight: As you can see from the picture above, I also carry a small flashlight. This is something my wonderful husband got me this last Christmas. He carries one all the time and knows that when you have it, you use it. Constantly. And he’s right. I’m thrilled that it is small enough to fit in my pocket or even clip on my wasteband, but since it’s modern LED technology, it is bright! I pull that thing out at least several times a week for one reason or another. And it doesn’t hurt that it’s purple. My favorite! Knives: I carry two knives on me almost every day. The black folding knife is a cheaper replica of one I’ve had since I was 16 years old. I use it all. the. time. Imagine opening a box that just came in the mail. Instead of finding the scissors or a kitchen knife, I pull out my pocket knife. Or you’re outside cleaning up the chicken coop and find some bailing string tangled around the fence. Rather than leave it till later or go find something to cut it, I can whip out my knife right then and there and get the job done. I probably use it on average at least once a day. Now, it is a rather large knife (by normal standards) and I know the general public can be a bit nervous about sharp, pointy things, so I am careful when and where I whip it out. But it is a great tool to have on hand. The other knife I carry is a mini multi tool. This is the kind that has the scissors in it as well as a few other tools. I use the scissors and knife blade the most. The scissors are great for when we’re out and about and I find a string that needs cutting, etc. Usually Princess Girl is asking to use them to cut the top off a honey straw. I use the knife blade in those situations when I don’t feel it appropriate to pull out my larger blade. But just the other day, I also used the screw driver it to tighten a screw. Worked great. Sometimes though, I’m wearing an outfit that doesn’t have the right pocket to carry this one, so it might not be worn. Belt: Since I wear jeans 99% of the time, I have a belt on me 99% of the time. As I said in my post about making it, I decided that I would make a paracord belt so that I have tons of cordage on me at any time. Paracord can be used in thousands of ways, and I think I have about 75 feet of it in that belt. If I ever needed to disassemble the belt in order to use the cord, I would just cut a length to tie around my waist as a simple belt. And yes, this is not something I use every day – other than as a belt. It is truly an emergency item I like to have just in case. Phone/Camera: The last thing I have on me constantly is my phone. Since we don’t have a house phone anymore, I like keeping my cell at hand. If it’s in the other room and someone calls, I won’t hear it. But more than that, I love having a good camera on me at all times. All the pictures on this blog were taken with my cell phones. I love that I can snap a picture or two (or 50) of whatever catches my fancy. And as a blogger, that means I can usually capture the moment to share with my readers later. So these are the things that are on my person all the time. Or nearly so. There are times when whatever I’m dressed in isn’t conducive to wearing a belt, for instance. But really, the belt is about the only thing that I might leave off completely. My big knife and flashlight usually get tucked into the band of my bra so I can still wear them even with a dress. Not real comfy, but tolerable for a day. And I have chapsticks stashed in several places of the house so even if I don’t have it on me, they are easy to get to. And if I’m out and about, I will have my purse, and if it’s not on my body, it’s in my purse. So there you go. An EDC for a homesteader. 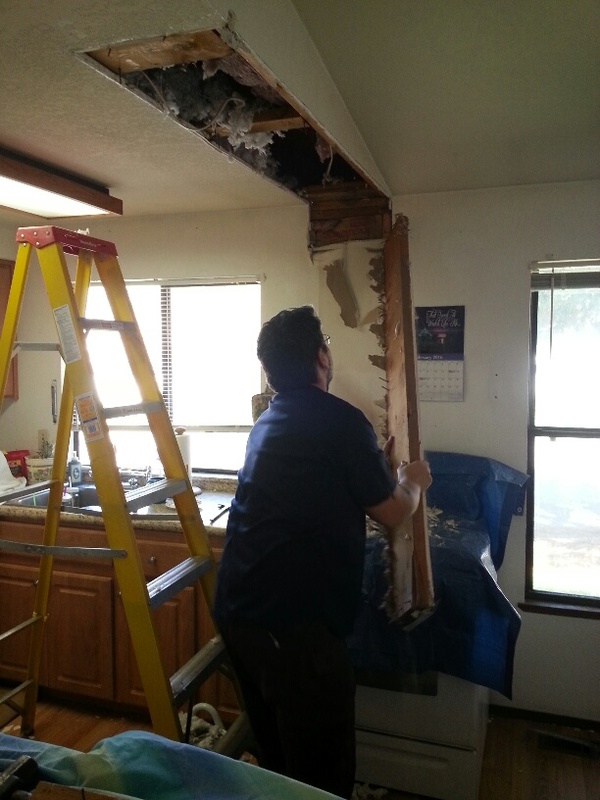 So today we started a project that is intended to get the house ready to sell. 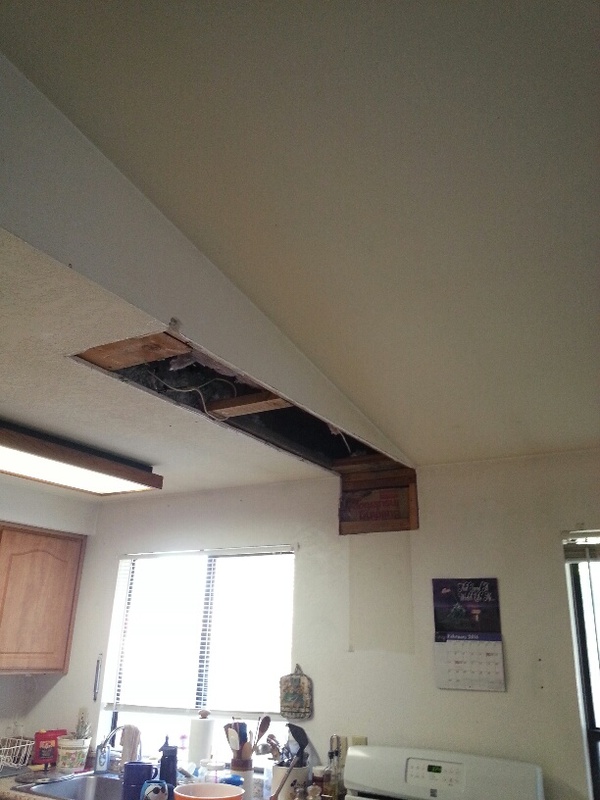 Years ago, Dad and Mom had their kitchen rearranged, but never did anything with the old soffit (a dropped down portion of the ceiling that the cabinets used to hang on.) So, today, we got that torn out and Dad and Hubs went to the store and bought an over the range microwave. Win-win! We finally will have a vented hood over the stove (which it should have had all along! 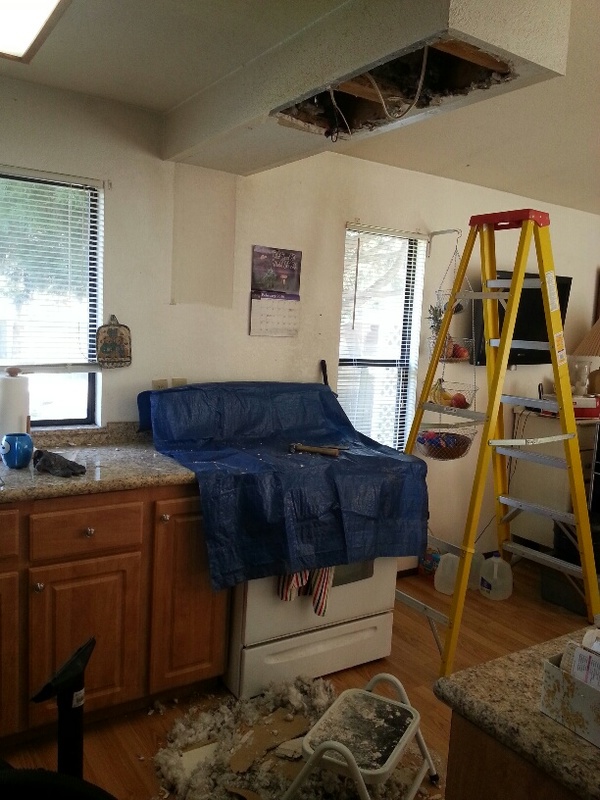 ), and the microwave will finally be up off the counter, giving us much more counter space! 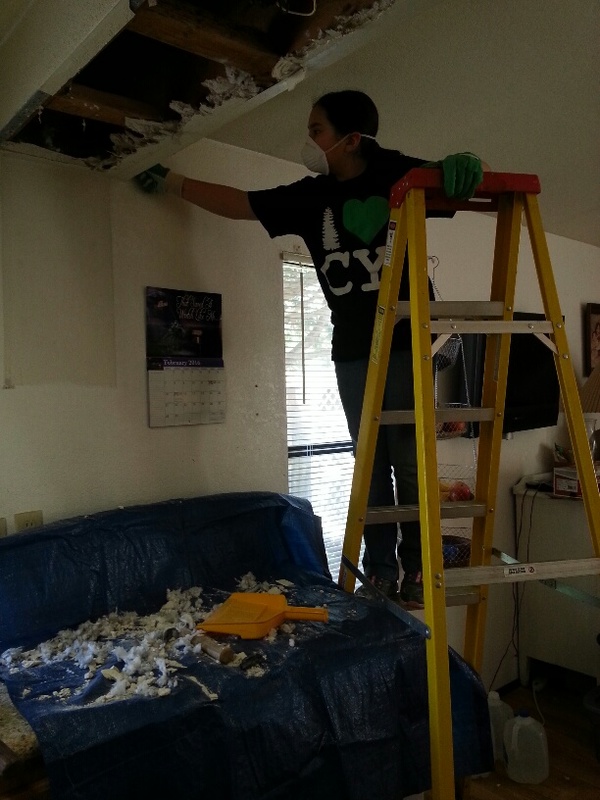 Princess Girl was a great help! Flower Girl had my camera and wanted to take a picture of her “pitty pink shoes”. 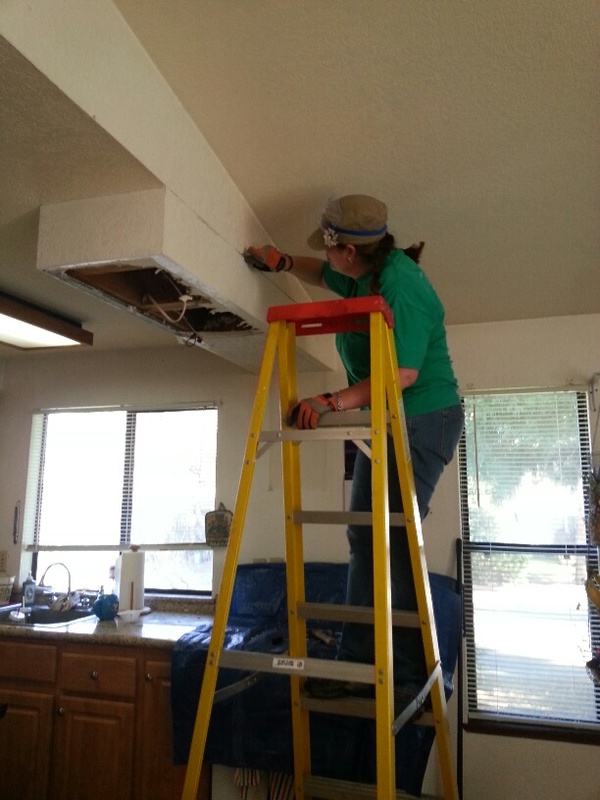 All ready to do the electrical and hang the new microwave and then put new drywall in. Yay! So that was our very eventful day yesterday. Oh, I also finally got some boxes so we can start boxing up things for storage or garage sale. Since we’re going to be living in the trailers afterall, we have to go through the downsizing process all over again. Especially Mom and Dad who own 90% of the stuff in this house. We don’t really have much to get rid of. But we do have a lot that needs to go back into storage. But I am totally ok with having to go through all this once more since it means we are moving back! Until then, thanks for hanging in there with my mostly uneventful month of daily posts. Maybe once we get the house built and are settled onto the new place I’ll do it again and we’ll see how/if our daily routines will have changed much since I’ll be a homesteader living on a homestead rather than in the city. Maybe they will, maybe not. Because at the end of it all, us homesteaders are mostly just normal people who choose to live an uncommon lifestyle. And if all goes according to plan, our life is about to get even more uncommon. And we’re soooo looking forward to it! This entry was posted in "Daily Life" journaling, DIY, Miscellaneous, Portland Interlude 2014-2016, Skills and tagged "Daily Life" journaling, Construction, DIY, EDC, Every Day Carry on February 26, 2016 by Maridy. Daily Life #9 – Failure is always an option. First of all, hello to our new followers! I’m so honored that you are here! If you’re new to reading this blog, you can learn a bit about our journey by reading our About page. So this is Day 9 of my daily life posts. If you’re just tuning in, you can read all of them, or at least go back and read about why I’m doing this month of daily life posts. And that reminds me; why did I start on January 26th? That seems like an odd time to start a project. Why not January 1st? Or even wait a few more days and start on February 1st? Well, I would have loved to start on January 1st, but I didn’t think of it till the 26th. 🙂 And as for waiting, normally I would have. In fact, I normally would have waited until spring, when my life was a bit more exciting. 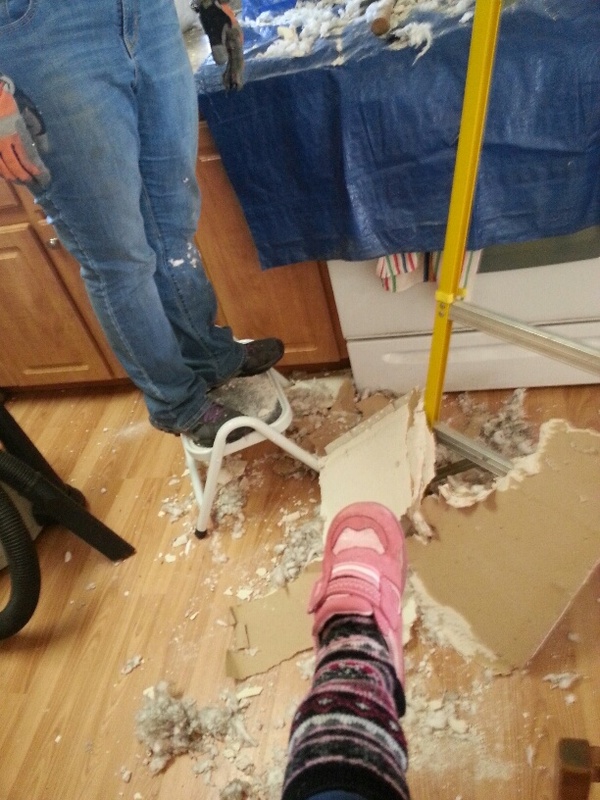 Hmmm…let’s see, aside from the usual of cooking, cleaning, and caring for the family, what all did I do? Ah, that’s right, I did my hair. Why mention this on a homesteading blog? Well, just because I’m a homesteader doesn’t mean that I don’t care about my appearance. I like to look nice as much as most people. Sure, there are days when my hair goes up in a bun and my flyaway bangs get pinned back, or I throw on a hat. But often I like to “do” my hair. The pictures below were taken a couple years ago when my hair was a bit longer than it currently is, but shows a good contrast between my “Hermione hair” as my man calls it, and how I like to style it on a regular basis. 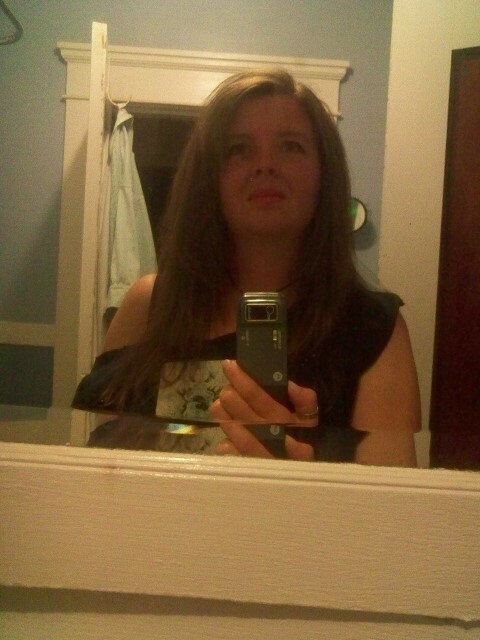 Before, with my hair like Hermione Granger from Harry Potter – I had gone to a party where we dressed 80’s style, thus the off-the-shoulder shirt. But then. those are coming back in style, aren’t they? However, in the spirit of reducing (my time, the energy used, etc), I try to find the fastest, easiest way that works for my hair with as little hair product as possible. And now that it’s growing out, that means straightening it, no hair mousse needed like when I let it go curly. 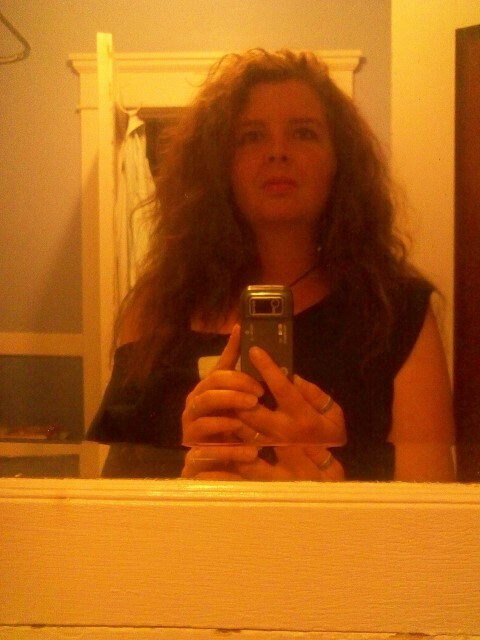 Yes, I am blessed with hair I don’t have to wash every day, and it’s cooperative enough that unless I get caught in the rain, I can straighten it one day, and not have to mess with it (other than brushing) for 3-4 days afterward. So I spend 20 minutes on my hair once or twice a week to get it looking how I like it. Then all the other days, it’s usually less than a minute. Can’t get much easier than that! Ok, let’s see, what else did I do all day? Princess girl and I went on our Bible Study Date. It’s a weekly date that we have. She wants to have more in-depth study time, and I know that if I don’t make it a “date”, the chance of it getting pushed under the rug in lieu of “more important things” like dishes and laundry (heavy sarcasm there) is all too likely. And, I started working on a belt. This is where the “failure” part comes in. I found instructions online of how to make a paracord belt. I figured it was high time I give it a try. 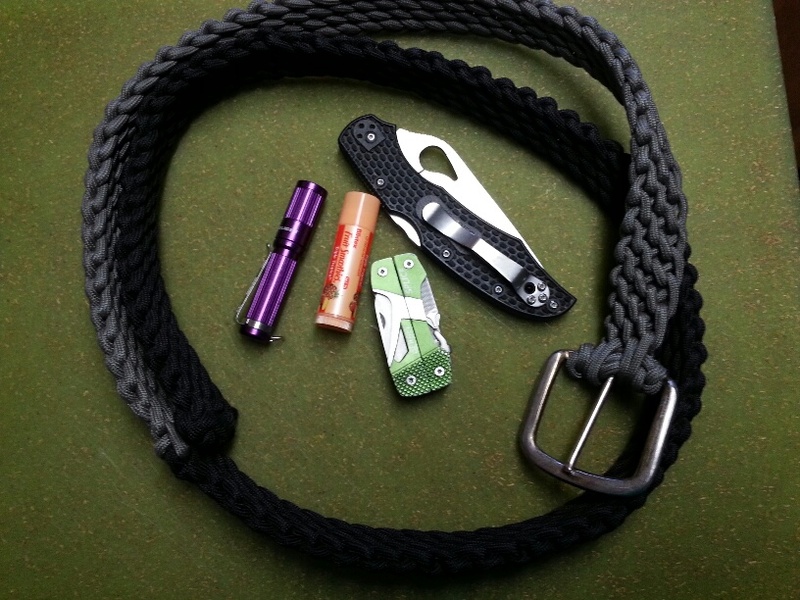 I want a new belt, and I like the idea of having lots of paracord on me. I typically wear a survival bracelet, but I want to change things up. So, I worked and worked while watching TV with the family. It took me 3/4 of the belt to finally really get the weave right so that it was consistently looking good. And then I ran out of paracord. And still a good 6 inches left till it was the right length. Grrrrrr! So I ripped it all out and I will start over tomorrow with a different color that we have more of. So, yes, my first attempt at making a belt out of paracord failed. But as Adam from Mythbusters likes to say, “Failure is always an option.” Because even though it didn’t work out the first time, I learned a lot in the process. And that’s a great attitude to have for a homesteader. Failure is going to happen. Whether it’s that your tomatoes didn’t do so well this year, or the litter of rabbit kits all died from heat exposure (please don’t ask me how I know 😦 ), you are going to fail somewhere, sometime in your journey. The question is, what do you do with that? Do you give up? Or do you collect the data and analyze what happened and do better next time? It’s all up to you. This entry was posted in "Daily Life" journaling, Portland Interlude 2014-2016 and tagged "Daily Life" journaling, DIY, Natural, Urban Homesteading on February 4, 2016 by Maridy. I got to sleep in this morning! It was heavenly! And needed after several nights in a row of poor sleep due to not feeling well. By the time I ate breakfast and finished my journal entry (which I started yesterday morning), showered and dressed, etc, it was time to take Scooter to the vet and do a bit of shopping. Later in the afternoon, I met a lady and took a floor mat she no longer wanted off her hands. 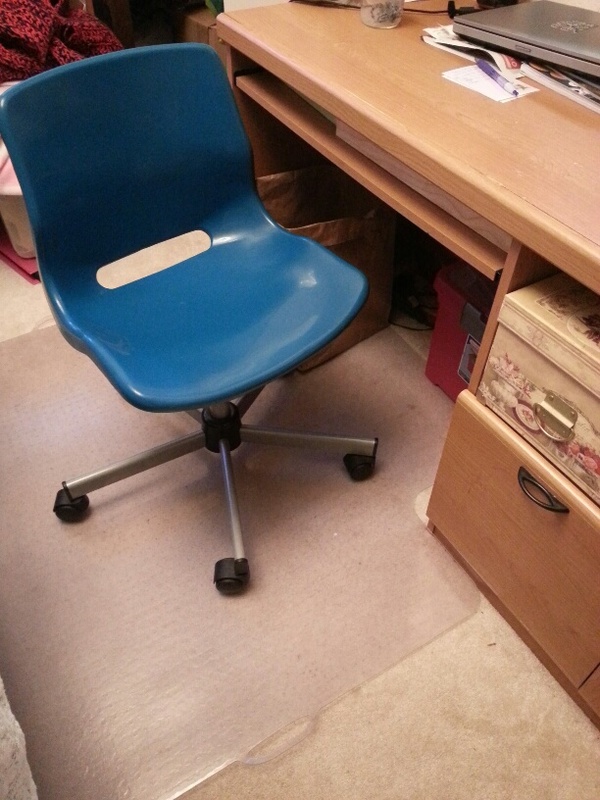 Don't you just love my thrift store desk chair? I love Freecycle! That or the free section on craigslist. I know there are even more free trading/swapping site out there. Have you ever used any? I highly recommend it. Not only is it a great way to find items you might need without having to buy new, but it’s a great way to get rid of items you know have a use, you just no longer want them. We’ve gotten quite a bit of good quality wood which we’ve used for several projects around the house. This afternoon, I also checked on my wicks which had been soaking for 24 hours as the instructions said. 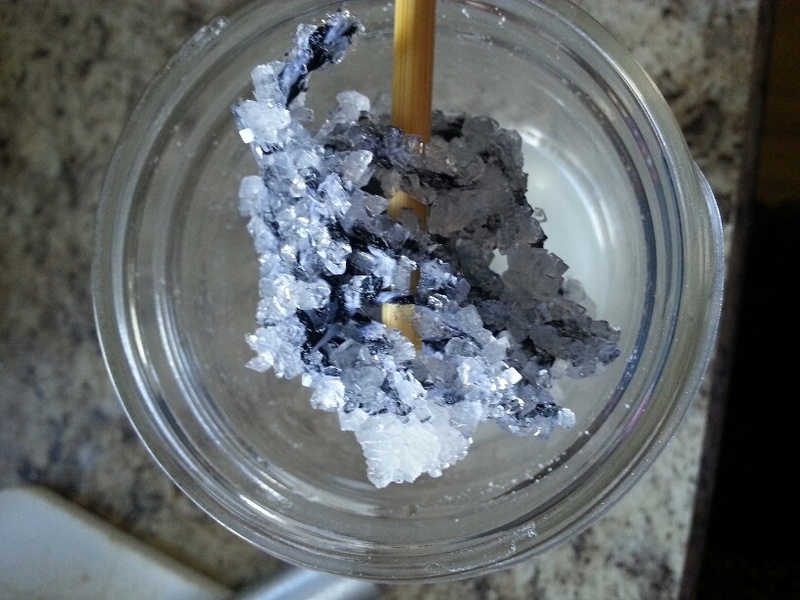 The solution had crystallized! Weird, but cool. Not sure what happened. But I saw other instructions which said to soak for only 20 minutes. So I soaked another section of string for about an hour and it is drying right now. I left the crystal solution in there to see what it does if I leave it longer. I plan to also try a few other options I have heard about and see what all makes a difference. After dinner, I sat down with my garden journal and started planning my 2016 garden. As I said in my New Year post, I’m not going to be as ambitious this year, but I still want it to be organized. Basically. I was looking for what can be planted in a small space that either yields a lot on one plant (ie, a tomato plant), or is small enough that you can plant a lot in a small place (like lettuce). And of course it needs to be something we actually eat. And something I don’t have to tend to a lot. When I have the finalized plan I will share it with you. This entry was posted in "Daily Life" journaling, Portland Interlude 2014-2016 and tagged "Daily Life" journaling, DIY, Recycle, Reduce, Reuse on January 31, 2016 by Maridy. Day 3 of my month of Daily Life posts. Not much happened. Today was one of those days I seemed to be busy all day, but didn’t get anything tangible accomplished like yesterday. I was planning on working some more outside, but I’m not feeling very well today. I cooked three breakfasts at different times (mine at 7am, the girls’ at 8:30am, and Mom’s at 9:30am.) Took care of Mom while Dad went to breakfast with friends and then worked outside in the yard. Let the chickens out of the run to roam. Started laundry (which reminds me, I need to go switch loads.) Ummm… I’m sure there was more between breakfast and lunch. After lunch I took Flower Girl for a walk around the block. 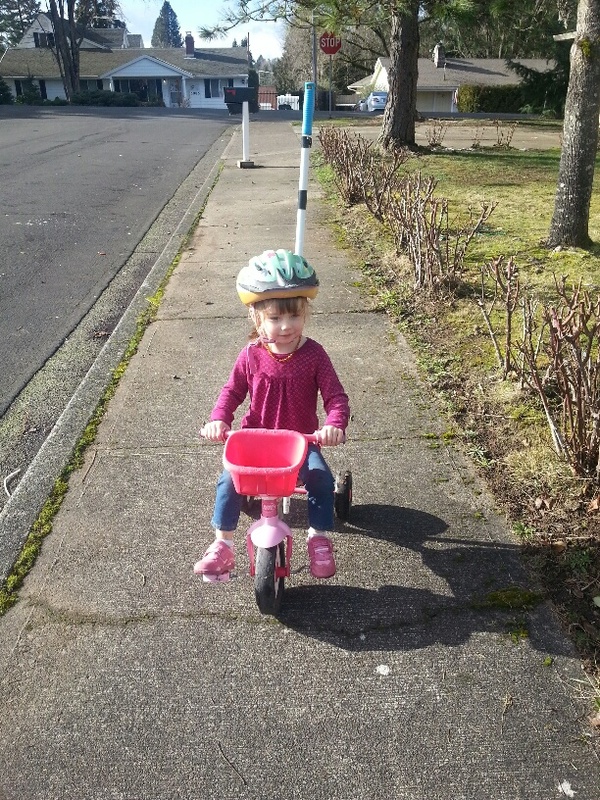 She’s finally learned to pedal her tricycle all by herself. Then it was home and some computer work. Helped Princess Girl with some of her school work. My wonderful Hubby made dinner, which was awesome. Then I laid on the couch and vegged with the girls and my man. So you know, a normal, mundane type of day. I should have done more actual work on the computer (you know, rather than Pinterest). I should have gotten up to vacuum since our vacuum was in the shop for several days and the carpets are nasty! I should have switched laundry around several more times and put clothes away. I should have documented some ideas I have for the homestead. And I’m ok with that. It’s not every day I have a legitimate reason to take it easy. At least that’s my life. This entry was posted in "Daily Life" journaling, Portland Interlude 2014-2016 and tagged "Daily Life" journaling, Family, Homestead Kids on January 28, 2016 by Maridy.